Here is a card I made for a customer of mine. I was asked to make a card for a Diamond Wedding Anniversary. On the card I have used a scanned image of the photo. I love to use photos on cards, especially wedding photos when you need to make a card for a landmark anniversary. I always take a scan of a photo, so that I can use the Scanned image and not ruin a precious photo. I then size the image to fit the design of the card and print out on photo paper. Yesterday afternoon I had two lovely ladies, who are on holiday in the area, visit my shop. They saw a sample card and were asking what was used to make it, I explained part of the design of the card was peel off waste. They were a bit intrigued so I gave a little demo. Here is the card I made from the demo piece. I promised I would put the card up on the blog so they could see it. I hope you like it ladies. Let me know what you think. 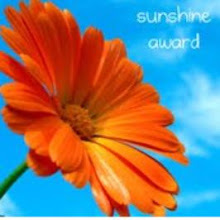 I am so exited I have been just given my first ever award. I am chuffed to bits to be chosen for this. 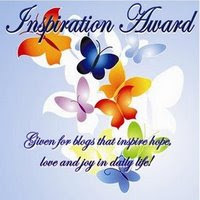 I have been awarded the Inspiration award by http://ticketyboojewellery.blogspot.com Thank you so much Becky. Well I have thought about this and it has been a really difficult one to answer. I have always been scared of making myself look stupid, when meeting new people. I know I run a shop and, have worked in shops for years, so I suppose I have learnt to hide it. When I was a lot younger It was quite a problem for me. Well I had better get back to doing some work. I have a couple of classes to prepare for tomorrow. Well I couldn't resist playing with these very cute stamps. 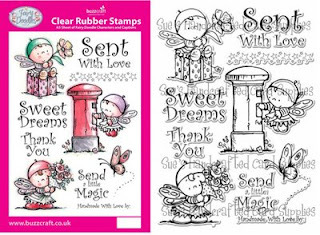 I have to admit I don't do a lot of stamping but since I have had the Fairy Doodles I can't leave them alone. Before I bore you all to death with them I promise this is the last for now. I hope you like these stamps as much as I do. There is some thing for everyone and almost every occasion. Gems used where clear, I coloured them with pastel coloured Peel Off permanent markers, from TrimCraft. Here is card made using a stamped image from the Fairy Doodles range from Buzzcraft. I was asked to make a quick Wedding card today. So I kept it simple, decoupage would of taken too long ( I only had Half an Hour) so this is what I came up with. The back ground paper was from DCWV Nana's Nursery. I used a pair of scalloped scissors to create the decoration for the cake and the little flowers were Making memories mini blossoms. The wedding cake topper it's self was made from scrap pieces of card stock, I used ClolorBox Fluid Chalk pad "rouge" to add detail. I've not been playing with my pazzles machine for a change. Instead I have been doing some quilling. I don't do a lot because I find it too fiddly but I love doing these fringed quiled flowers. They are very versatile and I find them a useful way to use up some of those papers you don't like or don't know what to do with. Click on the photos to get a closer look. The flower on this card is large , I cut the strip of paper at about 3 cm width X 30 cm in length. and Core Color Blue Moss. So you now have no excuse, get out those papers that are lurking in the bottom of your craft boxes and see what you can come up with.